14th Sunday Yr B – How do you pick yourself up? Ezekiel worked as a Priest in the Temple before being exiled with Israelites into Babylon. It was here, in a distant land, he experienced the spirit enter him and raise him to his feet to ‘speak’. It was not a popular message; the cause of their exile and punishment was due to their unfaithfulness to God. Have you experienced being moved from a ‘comfortable’ to an ‘uncomfortable’ place? Have you felt the spirit strengthen you for a new and difficult challenge? How do you think Ezekiel felt knowing the outcome of his words was uncertain… will they heed or resist? Today we reflect on a deep and personal self revelation of St Paul. It is uncertain if the ‘thorn’ (translated also as stake’) was a physical ailment, disease, depression. Was it constant persecution? Lust? Upset with being ‘short’? It is probably helpful we do not know as we can now all symbolically identify with Paul in our own personal experience of ‘pain’. What would you humbly own as your ‘thorn’? Some spiritual writers suggest the first deep question of spiritual direction is: where are you hurting? Boast comes from the word meaning ‘having your head held high’, from a position of understanding. Have you shared this with anyone. Would you like to receive encouragement to move from pain to boasting, and being accepting of your weakness? Jesus returns home to Nazareth and experiences rejection. Mark, the earliest gospel writer clearly describes the lack of faith of Jewish people and the Synagogue toward Jesus. At home in Nazareth they are attracted to his teaching but take offense (skandalizmai – scandalised) and even make a negative remark calling him ‘Son of Mary’. It was normal to refer to someone only using the title of ‘Son of Joseph- Father’. They are objecting to the uncertain origin of Jesus. Can you glimpse the pain and rejection of Jesus at home, with his own family members? Have you had a personal experience of rejection. Lack of belief in you. ‘Cutting you down’. ‘Putting you into a box’? How did you react? How does Jesus react? Are you curious as to what Jesus does next? 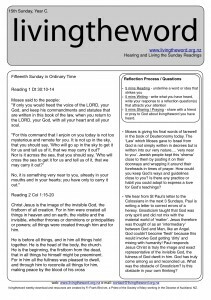 The three readings today highlight a theme of ‘if only …’. If only people would listen (Ezekiel)… If only I didn’t have this personal difficulty (St Paul)… If only my family and friends would believe in me (Jesus)…. Difficult circumstances can shut us down, take away our energy. We need another source of energy and identity. The spirit sustained Ezekiel, Paul, Jesus to respond positively not negatively. Consider naming your challenges and decide on positive solutions. How do you overcome the ‘Nazareth syndrome’? It is mysterious how Jesus ‘was not able to perform any mighty deed there’. Have you ever decided about someone and your mind and heart becomes ‘closed’ and not ‘open’ to that person? The relationship now becomes ‘stuck’ in possibility and expectation. We bring the closed door and negative view into each conversation and meeting. How open are you to Jesus? Pray for an open mind and heart to see signs and wonders and glimpses of the kingdom at work in daily events. How are you seeking to grow your faith and relationship with Jesus? Ezekial is regarded as one of the 3 great prophets (Behind Isaiah and Jeremiah). Ezekiel is both a priest and a prophet and is speaking during a time of Exile away from Home. Without temple practises, faithfulness to the laws of God kept Jewish identity and preserved unity. Ezekiel provides a powerful image of a ‘watchman’, standing, watching, ‘looking out’ for dangers that may be approaching your family. God’s family. Have you had the courage to ‘say anything and warn others’? What happens without ‘watchmen’? Are you challenged into action knowing that your salvation is at stake? What do you feel needs to be spoken of in your family? Community? Parish? To love your neighbour as your own flesh is a striking challenge. Jewish interpretation wriggled around the challenge by regarding one’s ‘neighbour’ as their own Jewish citizens. This allowed Jews not to care for ‘outsiders’. Ponder the essential challenge of loving everyone as your own flesh. In what ways have you wriggled out of the challenge? Matthew 18 is dedicated to life inside the Christian community. How is the community of Jesus supposed to respond to hurts and arguments that come from living together? A pattern is developed to avoid hurting and shaming those involved. Private conversation, then semi-private conversation and only as a last resort a public church decision. Reconciliation is not ‘brooding’ in silence. Is there anyone you need to approach ‘face to face’? Have you experienced the importance of a wise person to help ensure ‘every fact is established on the testimony of two or three’. Anger and resentment cripple christian hearts and disciples. Who are your ‘two or three’ guides to help your reconciliation journey? Treating a person like a Gentile or tax collector can be interpreted two ways. If reconciliation does not result, do we exclude or offer continued hopeful patience? What did Jesus do? The goal of Christian community is to witness to the world the love of Christ with each other. The authority to bind and loose is given by Jesus to the community in the context of prayer and agreement together. Is there need for prayer and discernment with a group about decisions you (or your ministry group, parish…) are making? Jesus makes a promise where two or more are in agreement in prayer it shall be granted to them. What prayer request would you like to share with friends. Who could you invite into your prayer / voice to God?